Oftentimes after seeing a demonstration of DraftLogic Electrical in action, electrical design firm owners and design build firm owners comment that 'Your electrical design software looks awesome, but we don't think our designers will give up control over the project.' This misperception is actually our fault, since during the demonstrations we focus on our awe-inspring automation that will yield a minimum of 200% increase in electrical design productivity. Even though DraftLogic Electrical works fast, in only an hour or so it is still impossible for us to show all the expert system electrical design automation; forget about having time to show all the ways that we accelerate even manual design work or all the ways that we put the electrical designer in charge of what happens during the automated processes. Thus this webpage! Herein we'll detail the ways that electrical designers are in control of what happens during our automated processes, how they can completely override the automated processes, and finally detail the options electrical designers have to complete their work manually--but still with some help from DraftLogic Electrical to both make the work easier and to speed the work up. There are over one hundred parameters that you set to control every facet of the automation. For example: the maximum voltage drop you want to allow in each of branch circuit wiring and in distribution feeders, the maximum amperage you want to allow before splitting to parallel feeders, whether you want lighting circuits on mixed service type branch circuit panels to go across the top of the panel or if you want lighting to take the left side of the panel, and whether you want the fault levels calculation to be based on a specific interrupting current or the utility transformer specifications or the main distribution panel's protection specifications. That's just five out of over ninety parameters! The parameters affect the electrical design decisions made by the DraftLogic Electrical expert system during Automated Placement, Automated Circuiting, Automated Branch Circuit Wiring, and during Automated Reports Generation. The parameters are held in the DraftLogic Electrical Project Library. In addition the the Project Library, there are three others, all of which hold data that controls what happens during automated electrical design processes. All of the designers in your company contribute to the four Libraries to make future projects even less work. The Room Library contains data about each room (aka space) type that you want DraftLogic Electrical to be aware of. The information therein affects Automated Room Creation, Automated Placement, Automated Circuiting, and Automated Branch Circuit Wiring. The Design Parameter Library is where you let DraftLogic Electrical know which room types you want used on a project and also what DraftLogic Electrical is allowed to place for branch circuit panels during Automated Circuiting. The Luminaire Library is where all the detail for luminaires comes from. This information is used during Automated Placement, Automated Circuiting, Automated Branch Circuit Wiring, and Automated Reports Generation. The four Libraries provide an intuitive and friendly interface to where users will need to most often control what DraftLogic Electrical is doing during automated phases. One time and infrequent adjustments may be made in the DraftLogic databases, for example your company may have a policy to not use certain rare sizes of conduit, in which case the database record for that conduit size can be marked as 'not available' and DraftLogic Electrical will never use that size of conduit when it is automatically sizing feeders or home runs. Whenever any schedule is requested that uses the feeders in any way, DraftLogic Electrical goes into your project and recalculates all the loads in order to select the proper protection and conductors for each of your feeders. Load recalculation verifies the load of each and every utilization device on each and every branch circuit and works its way upward through all the branch circuit panels, through the various distribution equipment, all the way to the main distribution panel. 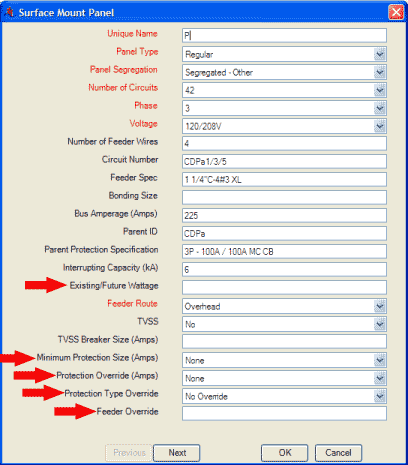 At the point where all the load on a particular branch circuit panel or distribution device has been verified and the protection and feeder are about to be selected, DraftLogic Electrical first checks a number of overrides and minimums/maximums that the user has the option of choosing for each individual device of these types. If you have made any specifications in these overrides, DraftLogic Electrical uses your override value instead of what it was going to select. 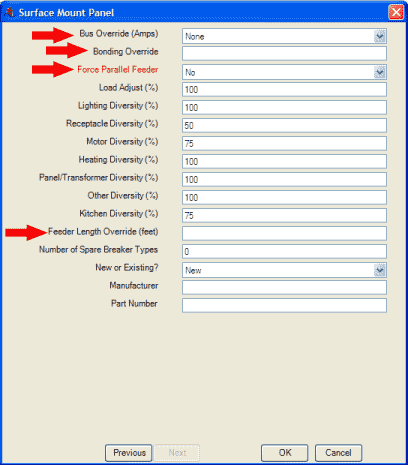 Above is pictured the DraftLogic Electrical Attribute Editor showing the attributes of a Surface Mount Panel. The opportunities for electrical designers to override automated selection of protection and feeder values are highlighted with red arrows. As you can see, you can choose to influence protection and conductors by selecting minimums or protection types, or you can exercise your electrical designer discretion by explicitly choosing the exact type and size of protection and quantity and size of conductors to travel in conduit that you also specify. In some cases, DraftLogic Electrical's expert system automation for electrical design will not give you the results you desire. The lighting treatment for a 'wow' entrance atrium for example. With raw uncustomized AutoCAD, you would be left to place your blocks completely manually, having to rotate and snap wall mounted devices to the wall and T-Bar mounted luminaires into the T-Bar cells. You would also be responsible for putting each block on the correct layer. DraftLogic Electrical allows you to do the work this way if you desire, we don't disable any standard AutoCAD functionality. If you desire, however, DraftLogic Electrical will automatically find the nearest wall point to where you click to drop a wall mounted device and then snap the wall mounted device to the wall and rotate the device to match the wall's rotation. Same thing with T-Bar mounted luminaires--click to drop the light anywhere in the T-Bar cell and DraftLogic will take care of snapping the luminaire in for you. 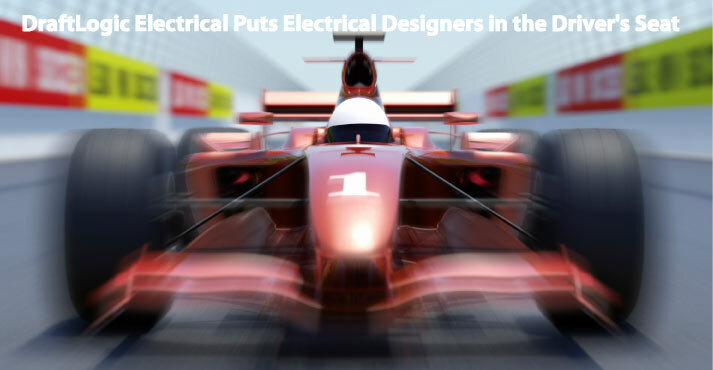 That's just one of the ways that DraftLogic Electrical accelerates electrical design drafting. When performing circuiting, you may desire to tweak the results of Automated Circuiting or may need to make all of the circuiting decisions for a particular space. In either case, DraftLogic Electrical includes an intuitive and robust tool to enable you to do whatever you want with circuiting & to do so with all the circuit information readily available. This is the Circuit Manager. It gives you complete control over which panel you are circuiting to, the slots you use, the type of circuit, the protection type, the protection rating, and the devices that are circuited. The Circuit Manager shows you how much wattage you have circuited & calculates the actual amperage plus the amperage including both building code required safety factor and any extra safety factor you may have specified in the project parameters. Branch Circuit Wiring can be automatically drawn by DraftLogic Electrical for the whole drawing or for a single circuit...you choose which circuits to run it for. You can draw additional branch circuit wiring using 'manual' tools that set the layering automatically for you or use the semi-automated tools that allow you to choose a starting and ending device and make the proper connection in either conduit style or cable style linework of your choice. In most cases, you will likely find it quickest to use the Automated Branch Circuit Wiring and then modify the results using the many grip points we place on Automated Branch Circuit Wire lines to change the line route or to delete and redraw only the lines you desire to replace. After executing Automated Branch Circuit Wiring or drawing Branch Circuit Wiring manually, DraftLogic Electrical has the Branch Circuit Wiring Manager to enable you to completely control what cable or conduit and wire are travelling along any branch circuit wire line in the drawing--regardless of how it made it into the drawing. 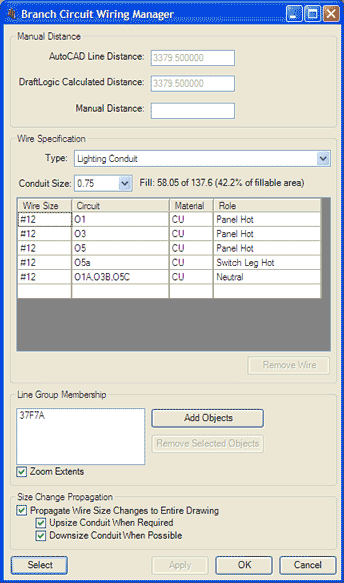 The Branch Circuit Wiring Manager allows you to override the length of an interconnection, specify the conduit size, see the conduit fill %, and specify the sizes and uses per circuit of each wire or in the interconnection. If you change the wire size of a hot, neutral, or bonding conductor, the Branch Circuit Wiring Manager will even automatically propogate that change across all interconnections that the affected circuit's hot/neutral/bonding travel through, including upsizing a shared neutral to match the largest hot that it is paired with. DraftLogic Electrical is a very easygoing fellow in regards to where a design comes from. What we mean by this is Automated Circuiting will handle both devices that were placed during Automated Placement and devices that you placed manually--no discrimination! This same 'all things are equal' philosophy carries throughout all the automation. As long as devices are placed in compliance with basic rules, like having a valid wattage on receptacles for example, each stage of Automation doesn't distinguich between what was done automatically in prior stages versus manually. Even all the Automated Reports and Schedules will treat valid manual data the same as they treat data resulting from prior automated phases of work. We wanted to ensure you knew that the electrical designer remains in complete control while using DraftLogic Electrical for their building electrical design work & hopefully we have achieved that goal. Please call or email if you have any questions about designer control or desire to know anything else about how DraftLogic Electrical can vastly increase your electrical design productivity while at the same time reducing errors and increasing the value you deliver to your clients!